To me, this scene illustrates late August. The lawn is a bit crunchy under your feet, the sky is clear and blue, and if you look long enough, the humidity can make you feel cranky. Okay, that last part isn't true about the photo, but it certainly is true about late August. The weather, actually, has been quite nice for August since it has not been scorching hot and the plagues of bugs (box-elder) haven't started yet. We could use a bit more rain, maybe an inch or two a week. I'm trying to be careful in my request after June's record wetness and the results we are still recovering from. Speaking of, here is a recent photo of the outside construction. The framing is finished and waiting for approval from the inspector. After that, the electrician can start the wiring and the chimney for the wood stove can be installed. I imagine some drywall should be starting soon, too. The jack-o-lantern effect isn't quite so strong in person. *g* I'm thinking a tall trellis with a vine up the left side would be nice. What do you think? One of our apple trees didn't flower at all this year. It was distressed last year and dropped lots of leaves. This year the leaves look great but no flowers, so no apples. That's okay, though, there's another apple tree in the orchard. We don't spray nor did I remember to put out containers of my mother's recipe of vinegar and water in spring to catch the bugs before they found the apple blossoms. However, there are a few good apples for us and plenty for the wildlife. This week has been a bit much for me, physically and mentally. I haven't been feeling 100%, I traveled to DC and back, and work has been piling on. On the bright side, I did work out yesterday at Curves and I think I'll be caught up with the majority of the excess work by the end of the day on Monday. I also made it through three rows of Forest Canopy on the plane Thursday before I fell asleep. Today we are heading east over to Pleasant Prairie for a brat fry with DH's side of our family. I'll have some knitting time and it will be great to catch up with family. Happy Sunday! I made some measurable progress on Forest Canopy on Friday. I believe I have about 21 more rows of the main body ahead of me. My good luck stitch markers from Nora accompanied me to the big city, but I am finding that yarn-overs and markers are not the best combination for me. Here's a better look at the shy little guys. They are very difficult to get a good photo of. what you see in this photo. I just started on the toe this morning. This was taken Saturday morning before the rain started. My flights home from San Francisco were delayed Friday because of the storms in the Midwest but I made it home just before midnight with a good amount of knitting accomplished. I enjoyed a few Saturday hours of warmth and sunshine in the garden before the storms moved in. I like a good thunderstorm but this is just too much. I think it rained and stormed for about 20 hours. We are happy with a break from the rain right now but it looks like more storms are on the way. As a reality check, a house up the road from us lost a roof, so we have a lot to be thankful about here. Our power was out part of Saturday afternoon and all of Saturday evening with the house coming back to life about 2:30 AM. This morning, my ISP was having difficulties delivering Internet connectivity but that problem was solved by early Sunday afternoon. I also spent a little quality time with a wet vac but that is best forgotten. My gardens are coming to life. The beans are sprouting and we plan to have broccoli rabe from the garden for dinner if the electric company cooperates. A radish from the former micro-greens, now probably better called macro-greens, though just as tasty. Does anyone have a good idea of what to do with chive blossoms? The wild phlox are glorious right now. And, yes, the nettles are pretty happy with themselves, too. The pretty and the painful. Let's all be careful out there. Here's the photo of my Forest Canopy that I promised Nora yesterday. This is the same amount of stitches as Monday when I promised so there is no, err, cheating involved. Forest Canopy is on the sidelines due to, among other things, my pressing need to finish my Brown Bag project for the MKG meeting this coming Monday. I'm actually working near home for the month of May. Pretty cool. My only challenge is to remember that I am not as full of energy at the end of the work day as I thought I would be when I made out my list of things I wanted to do this month. I do this every time I work and commute, which isn't all that often. I am just kind of startled to be sitting at my own dining room table tonight. I'll get over it in a few days and get a little routine going. One nice routine I'm starting is making a fruit yogurt smoothie for breakfast. Yum. 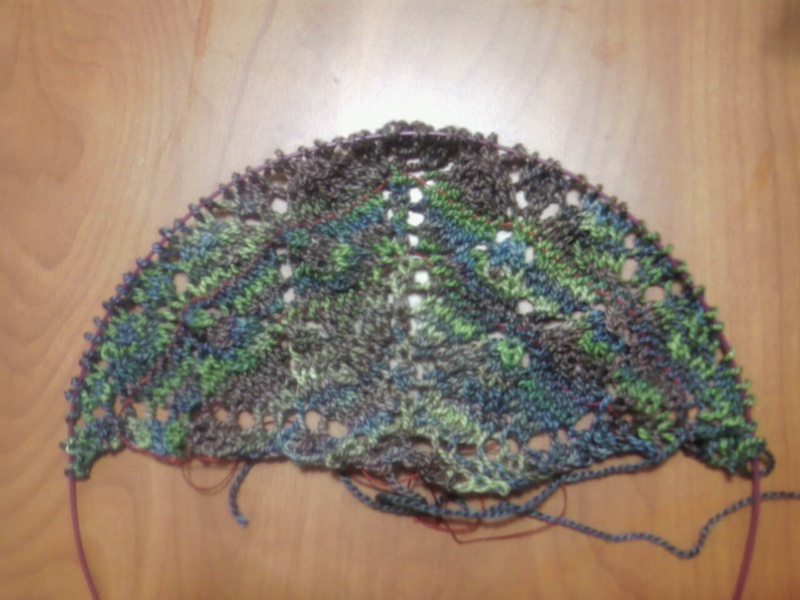 Here is an up-to-the-minute progress shot of the Forest Canopy shawl. I'm in the middle of the second repeat. I worked on it last night and for a few rows tonight after meeting with Nora. Nora! We forgot to use our cameras! Augh! We were just too busy shopping at Loop and talking. (posting from the 'phone...pretend there are links in this post.) I'm glad we were able to get together tonight. It is my last night in Milwaukee for awhile AND I was able to wish Nora "Happy Birthday!" a day early. Go visit her at Knotmuchofaknitter.wordpress.com and wish her a happy one, okay? I had not intended to wait so long to post this weekend but I got busy. The lengthening days with the extra minutes of daylight are having the desired effect of waking me from my hibernation*. After running errands, getting a massage, and general galavanting in Madison on Friday, Saturday found me in my studio---cleaning and straightening. I should say starting to clean because the winter (it wasn't me, it was WINTER) left that room a Mess. I cataloged more of my stash and entered it into Ravelry. I have several (ahem) sweaters' worth of stash....which are now neatly tucked away in little plastic bin/drawers that were on sale at Shopko on Friday. I still have a ways to go on that room today but I can see most of the floor now. I took time out from finding the studio's floor to walk around outside. 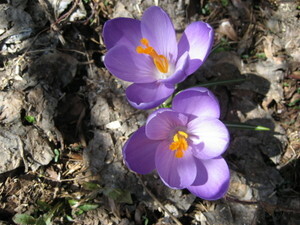 We have some crocus blooming on the south side of the house. 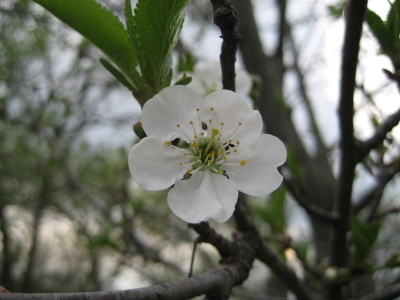 DH told me that one of our new crabapple trees is budding, which is excellent news. My garden boxes are beginning to thaw. 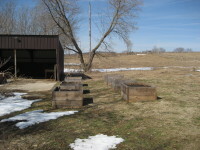 The soil is still rather wet and cold, so I won't be planting any seeds for a few weeks. Even with the wait, I find it heartening that the raised beds shed their cover of snow and will be warming up as they were designed to do. 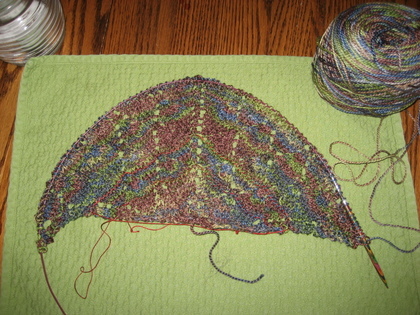 I also started my Forest Canopy Shawl. I'm Knitting with Nora in a very relaxed, no rules KAL. If you are inclined, please join us! I'm using Fleece Artist Sea Wool in the most appropriate Woodlands colorway. I've knit up through row 12 of the set-up. 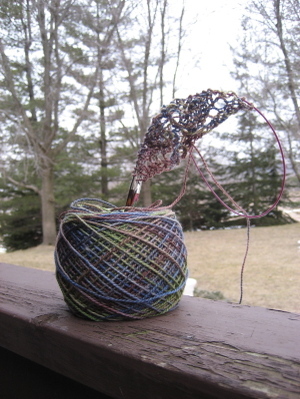 I am enjoying the yarn and the pattern. Good pattern campaign suggestion, Stacey!